Welcome to the 21st century boys! Nice site! Thanks,Artie……with my good looks and your expertise,we’ll go far.The Dan S Campbell Chapter meets at Duke’s Sports Bar 0n the second Saturday of the month.Time:12:00 Place:US 19 Spring Hill,Fl. We Welcome all Paratroopers. Good start with the site. Simple and clean. Way to go! Airborne! Thanks,Dom the site is just like me! All the Way! Our site has been up about a month now and you can count the number of respondents on one hand! Disappointing! Please provide us with some feedback. 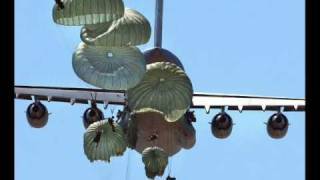 If you would like to renew/heighten your pride as a paratrooper check out the youtube video at: http://www.youtube.com/user/DanCampbellChapter I believe that you will enjoy it. I am a AA member of the Ridgeway Chapter in Dayton, Ohio. Just wanted to let you know I enjoyed your website. Thanks to Robert & Eric for your kind words and visit to our website.We appreciate you. Airborne-All the Way! Sure is lonely here. No One has written on this page in over a week. Where are our paratrooper friends? Where are our Chapter members? See you at the BBQ on Monday,21 February at 1800 hours.